You use one of the Data Service controls in your mashup. 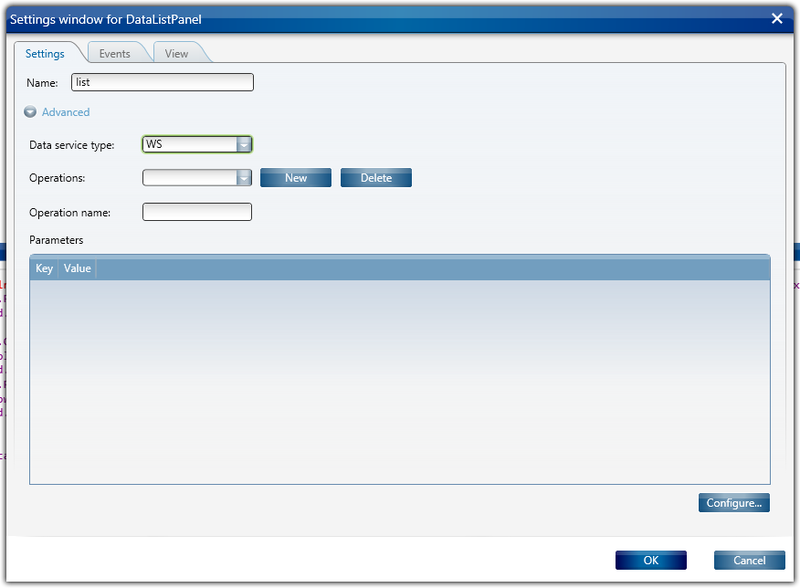 For example select Insert Control -> DataService -> DataListPanel. As a service type you can choose between REST, MI (M3 API) and WS. Now if you want to use M3 APS I would recommend the MIPanels but the access to M3 API is available as a Data Service as well. After selecting the type WS you will have the following screen in the Mashup designer. This is the standard configuration for all data service. There is a number of operations and a bucket of properties that you can set on each operation. Notice the Configure… button down to the right. Press it to get help with configuring most of the properties. For a complete reference check out the SDK Documentation found under Help in the Designer and search for WSDataService. 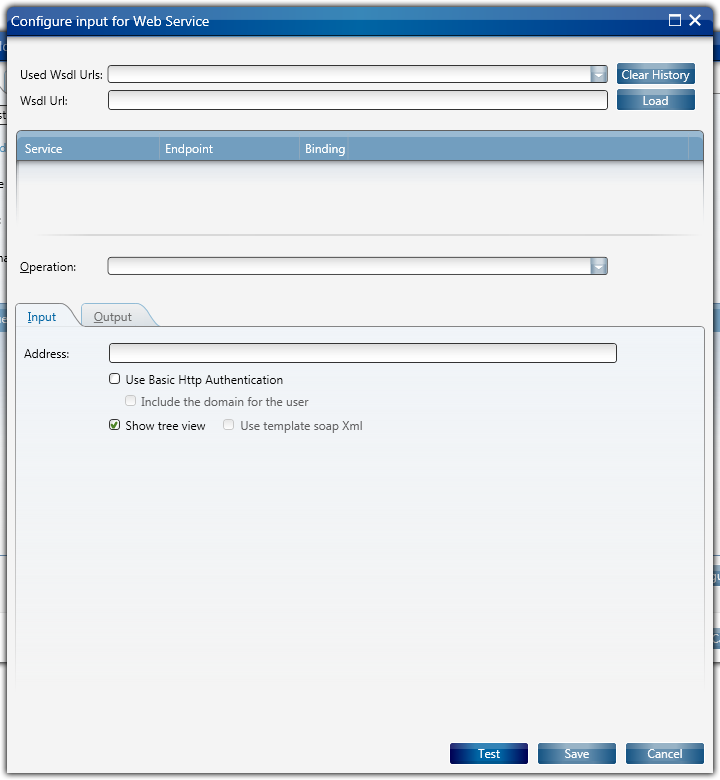 Enter the Wsdl Uri and press Load to download the WSDL and to create a dynamic proxy against it. The wsdl must be available at this URL for as long as you plan to use the Mashup. A dynamic proxy will be created once during each LSO session so the wsdl has to be available from the Client PC when actually running the mashup. So the URL has to be accessible both in design time and in runtime. The first drop down is simply a history box with previous URLs and does not affect the actual configuration. This configuration tool is also available as a stand alone tool (tool://wstest). I’ll enter a path to a M3 MI WSDL found on our LWS server, but you can just as well use a WSDL that maps to an SQL query. You need to check out the documentation for Lawson Web Services. I’ll play around with MNS150MI and show companies and divisions my user has access too. I enter my login and password, other in data and press Test. If the call is successful the output tab will be opened. 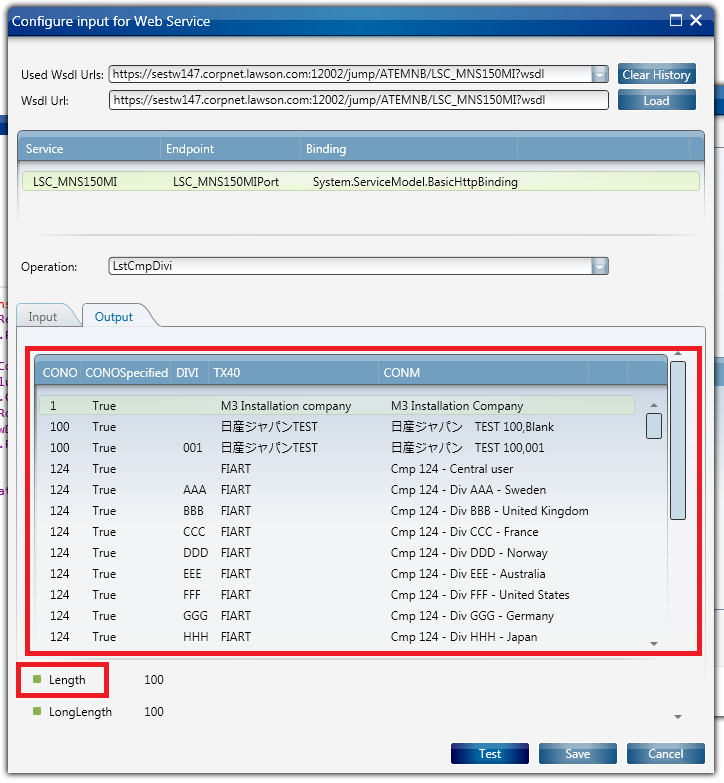 In the output view the output from the web service call will be generated. The output from a generated stub is always a class or a collection. Below you can see that the object returned is in fact a collection. This is because the first you see in the result view is a list and there is no description or label. Also notice that properties are available and in my case they are all green. That is good. If it’s green then it’s a property and not a public field. In order for binding to works the object you want to access has to be a property. A work around for binding to something that is not a property would be to set the WS.OutputPath on the property. Check the documentation for WSDataService for all configuration options. Say I want to show this list in my Mashup. Now the DataContext will be the object returned from the Web Service. In my case a collection of objects that has the same properties as the headings in the list. I press save and I’ll have the data for the call back in the standard configuration mode. Lawson Web Services uses a header section to pass in context information (and also authentication information depending on version). Now you can bind in values such as current company from M3. 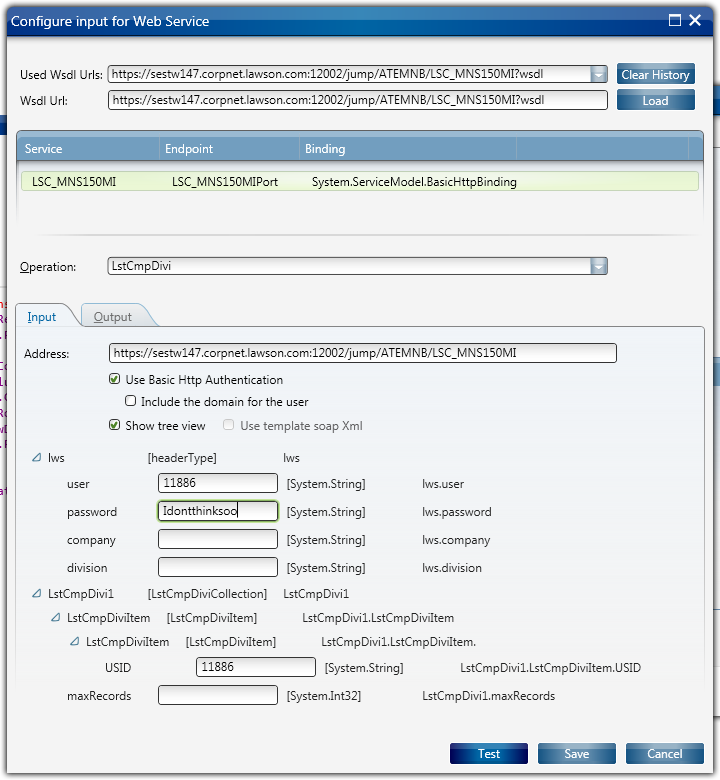 For the current LSO user and password you enter the following magic strings LSO.USER and LSO.PASSWORD. These will be replaced in runtime with the current user and password. However the user will be asked it she trusts the server you are connecting to. And this will happen once per session. This is because we cannot simply share credentials without some further configuration. In the Core settings there is a new setting called trustedServers. The administrator can enter a list of trusted servers and in that case the user will not see any message. Within my DataListPanel I add a DataGrid and set it to automatically create all columns from the data. Notice that the ItemsSource is set to Binding which will bind to the DataContext. I place the DataGrid within my DataListPanel and add a startup event. Now this is the complete XAML and the resulting view. Please note that the support for calling WS is preview state. We do not support all web services out there. If it works… it works. If it does not work you should contact support or comment in this blog and I’ll have a look but, perhaps there is a work-around or perhaps there is something that we can change to make it work. In any case it should work for many of the Web services out there. If you want to bind to a specific property you specify the path to that property in the binding. You can copy the path from a context menu in the test program. Check out the SDKDocumentation (available from the Help menu within the Designer), search for WSDataService. Sweeeet! Thanks for sharing a complete example. Karin, I tried a Lawson Web Service of type SQL but the Mashup doesn’t paint the DataGrid, even though the Test in the Configure wizard correctly shows data, and also in Fiddler I see the correct SOAP Request/Response being executed. If I switch to a Lawson Web Service of type API then the Mashup paints correctly the columns, the rows, and the data. We have LSO 10.0.1.1.5. Any idea why the SQL result doesn’t show? There are two options. Either using an event on the DataPanel that will use the setProperty approach of setting a property (see example in designer). Or a binding directly. Either way you need to know how to access the resulting data and that depends on the Web service called. By using the wstest tool (tool://wstest or from the deisgner) you can see and copy the binding syntax for the value you want by right-clicking. To set a textbox value to something returned from the DataPanel would be straitforward but I’m not sure what you mean with the example “have a button that would set the textbox text”. I’m afraid I don’t have a good example already done, but there should be enough information in this blog or in any of the other blogs to achieve this. Karin, at the beginning of your post you suggest the REST support in LSO 9.1.3 can be used to called SOAP Web Service using the “Template functionality”. Do you have an example? I thought about using XSLT to transform the XML SOAP Response to the REST XML but haven’t tried yet. I use the template approach in this post http://lawsonsmartoffice.com/2012/01/05/calling-a-web-service-using-ws-and-rest-data-services/. But you can’t XSLT transform the response Xml. You can strip the namespaces and you can use an initial XPath. There are quite a few “SOAP” web services that actually just takes a xml string as input and returns xml as a string. In those cases you might as well use REST since the data returned is specified as a string – so there is no type mapping. I think I understand your other post now. You’re making a SOAP call inside of a REST call? That’s good to know. Thanks. I’ve build a mashup which calls a sql webservice. Is there a way to set the maxReceivedMessageSize property? In the smart office SDK we can instruct the application to accept a bigger result. No I’m sorry. I will add it as a requirement. Thanks for your input! Thank to share these informations. I create a datagrid and i populate it with a M3 web service type SQL. Do you have an example with a combobox instead of a datagrid. I don’t know how to bind the collection return by the web service in a combobox ? Hi, you bind the collection to the itemssource and then you need to set the ValuePath to reflect the property with the value. I’m not sure what your response looks like. If you have a WS I can test. Send it to me! This was very helpful! I had the same issue as the first poster regarding an empty DataGrid from an SQL result despite a successful test during configuration. His/her solution worked for me. FYI. I have Mashup samples for calling Lawson Web Services for each adapter: API, MDP, and SQL. Contact me for details. I might write a post some day. Thanks for the heads up! I’m not looking for a sample at this time, but I’ll keep an eye on your site. I have the same issue as Gerwin, is there a way to set the maxReceivedMessageSize property yet that I might have missed? If not, do you have any suggestions for a work-around? As of LSO 10.0.3 ( I think ) there is a new property WS.MaxReceivedMessageSize that you can set. The work around for other versions is to use Rest with XmlTemplate instead of WS. Check if maxReceivedMessageSize property is available for the DataPanel in the Mashup Designer. I’m on version 10.0.4.0.22, but I can’t find or change the WS.MaxReceivedMessageSize property. I’m trying to set it as a mashup:DataParameter, is there another way to set it? You have to enter in in XAML manually. I forgot to add it in the designer! It will be available in the type-ahead options in the next version…. The workaround I used was TOP n in my SQL, where n is a limit, for example SELECT TOP 100 OKCUNO FROM OCUSMA, and for better usability I also indicated the number of records returned in the Mashup. I couldn’t find/change the MaxReceivedMessageSize property in the designer, and I am unfortunately unable to use anything but a WS at this point. Adding “TOP 100” to my SQL queries got rid of the error message, but if I actually want to show all entries I still don’t have a solution for that. Many thanks to both of you for all the help! I’m assuming you mean the selected row in a list where you use the DataService list panel and have a list defined within the control i XAML? To access the data behind the selected row you can use CurrentItem or a binding that takes the name of the list and uses the SelectedValue of the list. The selected value (as well as CurrentItem) will give you the selected rows data. How did you define the columns? xxxx should be replaced by the property that has the data. I don’t know what kind of WS you are using, what kind of objects is it returning in the list? If you can share a screenshot of the result tab in tool://wstest, the column name would be the name of the property. Or give me more information about the WS, like the wsdl or a view of the result XML from within a tool called SOAP UI. Then I can probably help you. Thanks a lot. I do not know how to paste screen shot here. Can you give me your e-mail address? I will send you the screen shot of my Mashup and the details to you. The datagrid is a wpf DataGrid. Thanks to Karin’s help with great patience. I have got what I need. Here is a summary. 1. SQL type of web service is important to make useful Mashup, as it gives us great flexibility. 2. 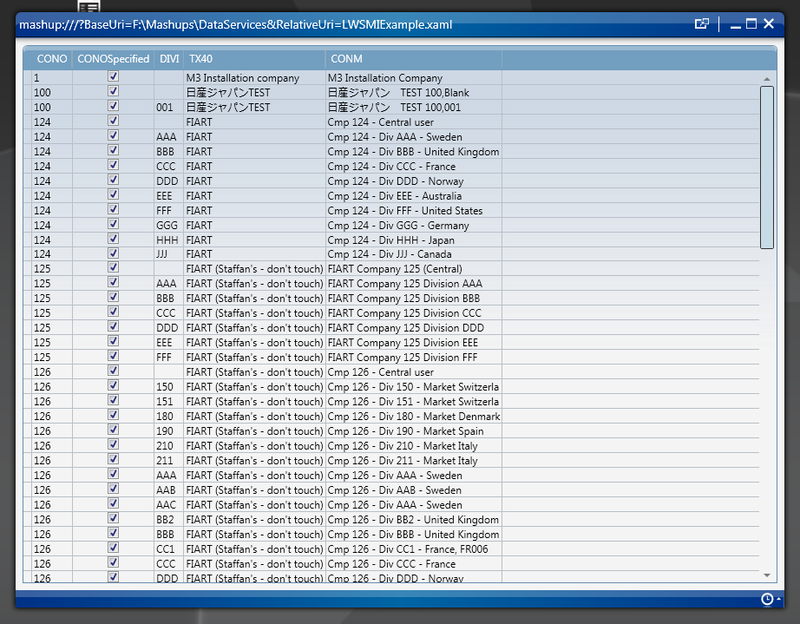 The XAML codes for manually adding columns are as follows. 3) thibaudatwork made a great comment on binding to the result collection. Otherwise the result will not show. 4) You can add the columns you want in any sequence. The elementname is not the datalist, but the datagrid. Price_List is the column name of your SQL web service result collection. Why don’t you use the MI-panels instead? Why use the SOAP way? Using the MI panels are faster. The WS data service uses WCF and generates a Proxy. It seems like you have tried all the options (the different credentials etc). I’m not sure what the header means. So no ideas. Check the SDK API documentation for WSDataService. 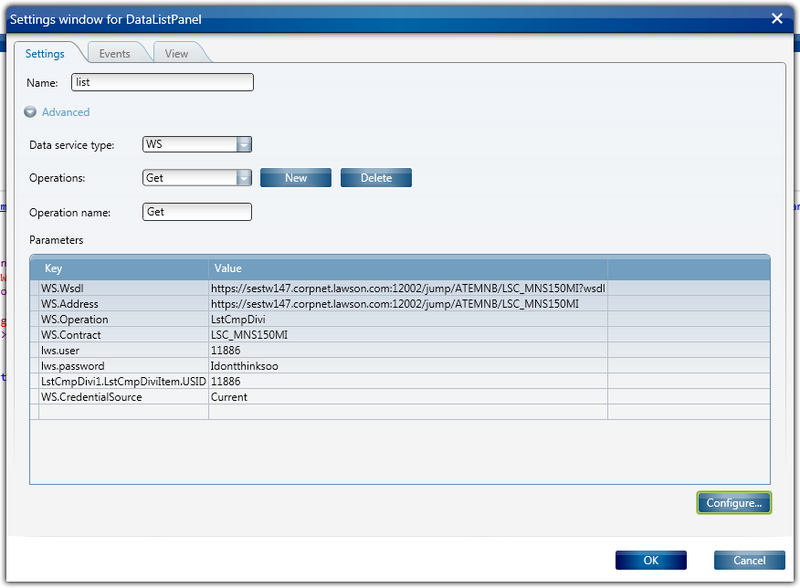 What does the example request look like in in SOAPUI? In some version of Lawson Web Services they requires a specific header to be set. (LWs.user) not in the soap header section but as a http header. But that was a long time ago. What is the version of LWS? (assuming that is what you are using). If all fails you should enter a support case. But you would need to gather lots of information, WSDL, Fiddlerlogs, Mashup etc. If would be best if we could access the Web Service or the Environment. I have one provider with two webservices I need to use. One to search for companies, and one to request report for actual company found by search. ” Exception: System.ArgumentException: The contract (BRGService) is not available in this proxy. I have seen your message and I’ll try and have a look when I have time. Did you check the log file in debug? Also check the Fiddler log if there are any hints. Compare to Soap UI. Can you please give me the input you tested with? There is an exception when generating the Proxy for the search. I did check to see if I could generate stubs in C# and that worked fine so a work around would be do compile the stubs and the script into a dll file and load that (a script can be a dll as well). Or you can use SOAP UI to get the input XML and then use the rest service to call the service. I don’t know why the dynamic proxy cannot resolve the WSDL.